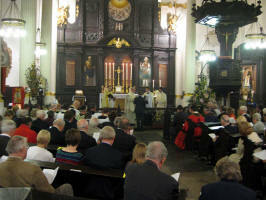 The new bells of St Magnus the Martyr were dedicated on 26th October, 2009 at a service of High Mass. The service kicked off with a performance of Vierne's "Carillon de Westminster", played on the organ by the organist of Great St Mary's, Cambridge (and ASCY member) Leigh Simpson. The Master and Stewards took part in the procession during this together with the Society Mace and the Master read the lesson. The 4 members of the St Magnus choir were joined by members of the London Ringers' Choir - Penny Sharpe, Cathy Cheeseman, Elva & Jo Ainsworth, John Hughes-D'Aeth, Andrew Graham, Leigh Simpson and Mark Humphreys. The Mass Setting was Haydn's "Little Organ Mass", and continuing the Haydn theme, the anthem was "The Heavens are Telling" from his "Creation". The preacher was the Archdeacon of London, the Ven. 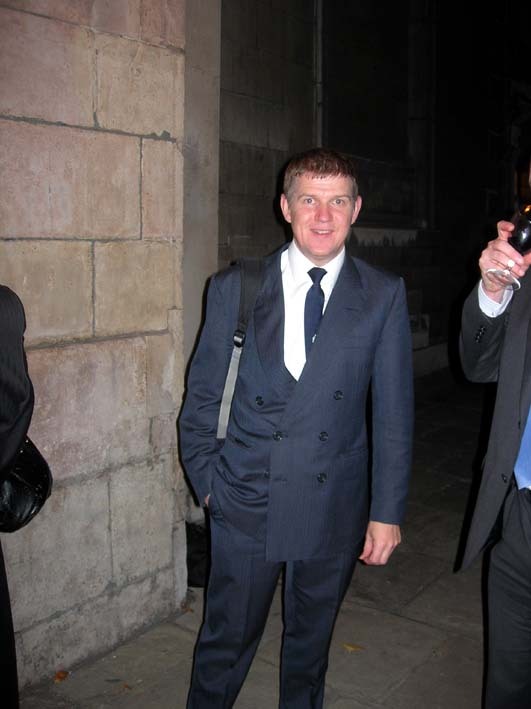 David Meara, who is also the Rector of St Bride's Fleet Street. The first dedication was that of the restored tower, which has been cleaned and restored externally as well as refurbished internally to accommodate the bells and ringers. Next came the dedication of the new set of handbells that were presented by the Whitechapel Bell Foundry to St Magnus Church in thankful recognition of the help provided by Tim Joiner during the hanging of the bells. The 12 bells were then rung to a course of Stedman Cinques by Past Masters: 1-2 Clarke Walters, 3-4 Chris Kippin, 5-6 Paul Mounsey (C), 7-8 John Hughes-D'Aeth, 9-10 Quentin Armitage, 11-12 Michael Moreton. The newly restored peal board commemorating a peal rung in 1762 of Double Grandsire Caters was then brought forward. This 7 foot peal board had been restored and reguilded, looking absolutely stunning. In his prayers, the Archdeacon remember all those who used to ring on the former ring of bells at St Magnus, and in particular those Societies no longer in existence such as the British Scholars, Union Scholars and the London County Association. Finally the Master walked forward and received the symbol of a bell rope from the Priest-in-Charge, Fr Philip Warner. He promised, on behalf of the Society, to fulfil all the duties of guardianship for the new bells and ringing. At the end of the service, the Priest-in-Charge ordered the bells to be rung. The Master and a band of members of the ASCY then pulled off into rounds followed by 7 leads of Bristol Maximus. 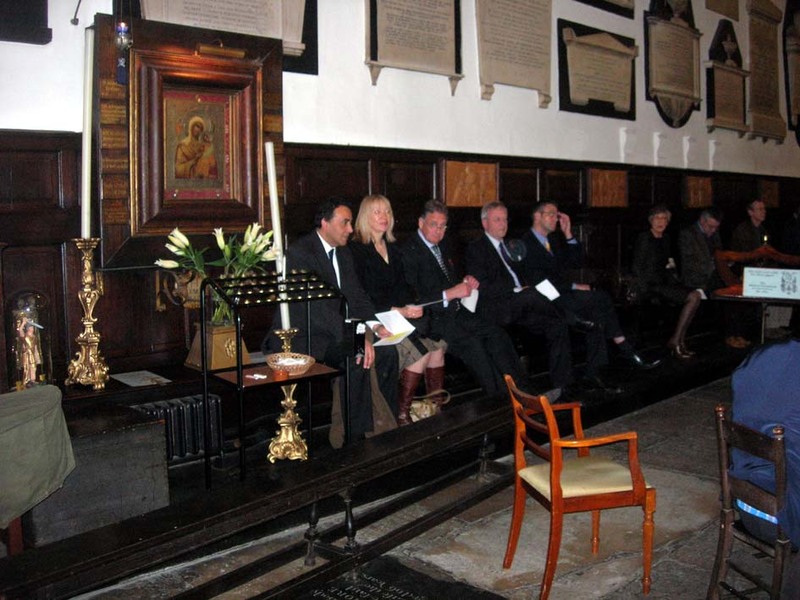 This was followed by exhibition touches from the Middlesex County Association, the Society of Cumberland Youths, and the Southwark Cathedral Society, before the tower was opened up for general ringing. St Magnus was very pleased to welcome, once again, Harold Rogers, who had rung on the old bells and in whose wife's memory the 3rd had been donated. However they also welcomed Dennis Brock who had an even keener memory and, with Harold, both reminisced about the pre-War days in ringing. It was almost exactly 5 years ago that I first met Fr Philip to raise the subject of the possibility of putting a ring of bells back into the tower here. I was delighted at his immediate positive response, hearing how the restoration of the bells would fit into his future plans to bring this church back into the forefront of worship in the City. Of course, he was clear that there was no money available, but we were able to quickly demonstrate that we had the capability of raising it. Since then, I am grateful to Philip and the St Magnus PCC for their unquestioning support for this project, and their willingness to engage with the bellringing community to see it through. Of course, the planning and installation of a good new ring of bells doesn’t just happen by itself. A church doesn’t just order a product off the shelf, put them in, turn them on and assume that the best sound ever will emerge from the tower at will. There are a lot of people who have been involved at different levels to help achieve what we have seen dedicated today, and I am grateful for the opportunity now to express this appreciation. 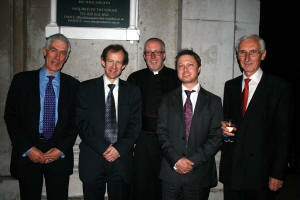 The Fund to raise almost £300,000 was steered by a group of hard working, good natured and expert trustees. My sincere thanks go to all of you for not only agreeing to take this work on, but seeing it through. To Paul Mounsey for chairing the trusteeship, David Hilling for his close and dogged management of the accounts, Graham Ralph for overseeing the Charity Commission application, John Hughes-D’Aeth and Fr Philip himself. 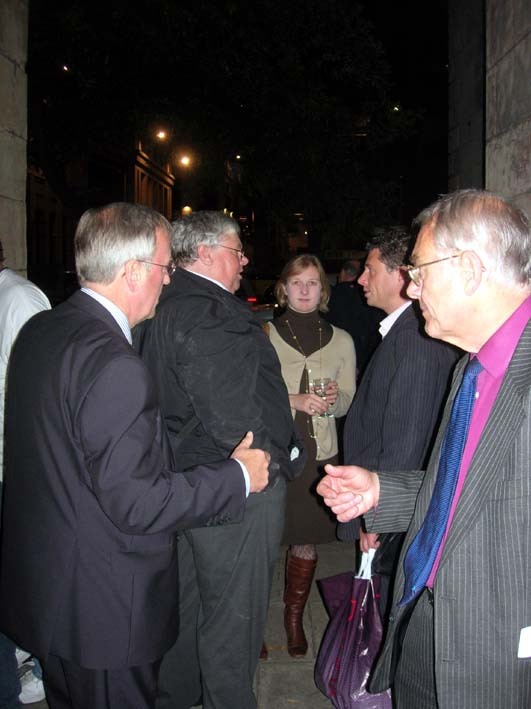 The Trustees were supported by the Fundraising Committee – Andrew Kelso, Michael Royalton-Kisch and the late Andy Collins. A special thanks too to Peter Rumley and his persistent engagement with the City and Livery that has resulted in so many good relationships, sponsorship and of course, generous donations. 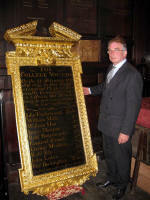 We are also grateful to Peter for restoring the fine 1762 peal board that was blessed earlier. We are grateful to our Patron, the Bishop of London, who made himself available for support and assistance during the fundraising campaign. He also presided over what I think must have been one of the most remarkable acts of worship I think I, and perhaps many of you, have ever had the pleasure of being part of, when he consecrated the bells on the floor of this church in March. 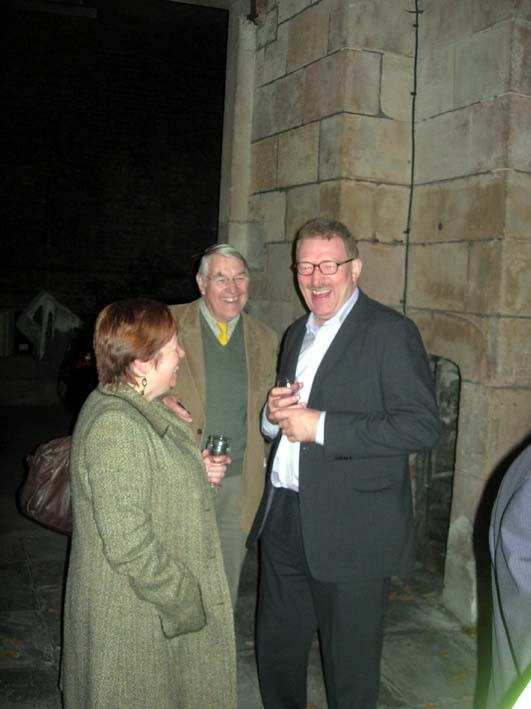 We are also grateful to the Worshipful Company of Plumbers who agreed to act as the Vice Patron for the campaign. This was very important as it reinforced the relevance of what we were trying to achieve within the Livery and the City. The Plumbers’ Company sponsored a bell, as did the Worshipful Company of Fishmongers. 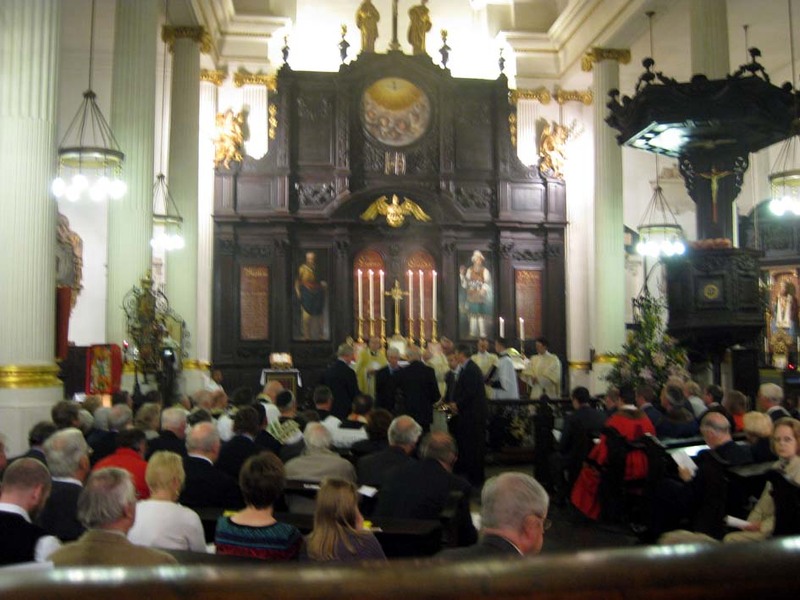 We also received a generous grant from the City of London, and the Lord Mayor graciously provided hospitality in the Mansion House after the Service of Consecration. 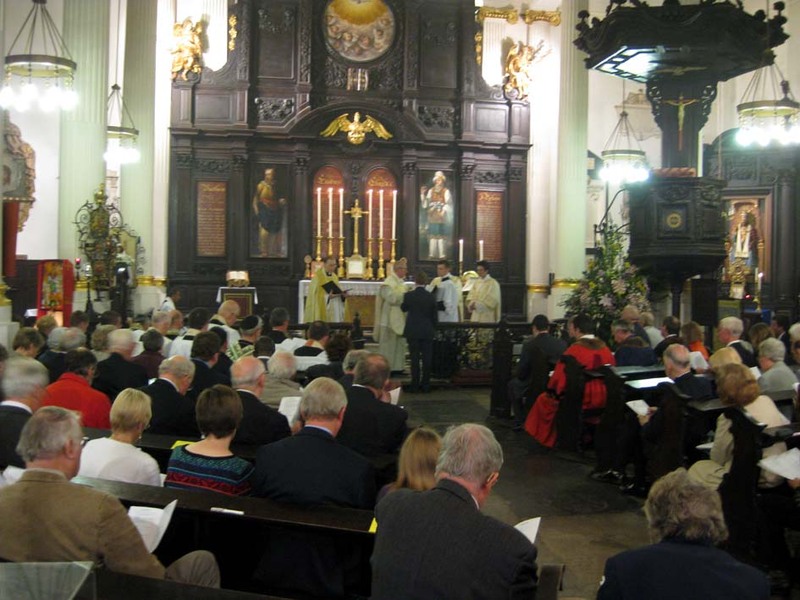 Speaking now as Churchwarden, this church is very proud of its association with the City and with the Fishmongers’ and Plumbers’ Companies in particular, and I am delighted to note that the Prime Warden of the Fishmongers and the Master of the Plumbers are with us this evening. Turning to the ringing community, the Ancient Society of College Youths has been of particular support. The Society made the conscious decision to renew its links with St Magnus and has given unquestionable support, both financially, and as an ambassador to other ringers and societies throughout the country. Not only did its own Bell Charity give us a generous grant, the Past Masters collectively gathered enough to sponsor one of the bells. The generosity of some of these individuals has been quite overwhelming, and I’d like to formally thank you all. However support from ringers has not be confined to the College Youths. The Middlesex County Association provided us with, I believe, the largest grant that they have ever given to a single bell project. 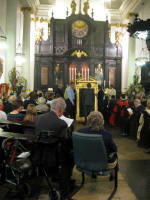 Now that the bells are in, I am delighted by the amount of interest its members have given to the ringing. They should be justly proud of their achievements in Saturday’s 12 bell Competition here, and with the introduction of regular practices, I am delighted that they are able to make use of these bells to improve their capabilities in the complex world of 12 bell ringing. 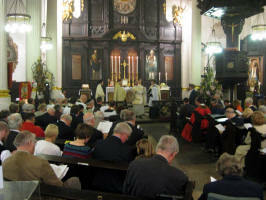 Of the £300,000 that was raised, the majority of donations came from individual ringers and ringing organisations. Bells have been given by ringers, given in memory of ringers, and given to celebrate ringing and friendship. This is phenomenal and words cannot express the gratitude I and the church feel for this. Now that the bells are in, I am delighted with the support received for Sunday morning ringing which has taken place virtually every Sunday since they were first rung on Easter Day. Being the closest thing we have to a local band, I am grateful that you continue to turn out, even now that the novelty has worn off. You do have an attentive audience from the congregation, and speaking on their behalf too, a big thank you! One of the most difficult decisions that the Trustees were faced with was to whom to award the work. Our two bellfoundries have been producing some excellent rings of bells, but after a careful and structured assessment, we elected to ask the Whitechapel Bell Foundry to cast our new bells. When I telephoned their Managing Director, Mr Alan Hughes, to tell him that we wanted him to cast the bells, after the stunned silence that followed, I added that I wanted him to produce THE BEST ring of twelve that he had ever cast. Clearly no pressure, he responded. Since then, Alan and I have built up an excellent working relationship, and a most enjoyable one – something quite important when you get to the point where you are on the phone or emailing each other pretty well every day! The work was completed without any hitches, all 12 bells cast, tuned and hung. And do you know what – they are seriously good bells. Whitechapel has produced a beautiful ring which sings yet has depth and the bells have a certain excitement about them. They are only 6 months old, and in that time their volume and richness has increased significantly. I wonder what they will sound like in a year’s time, and even over the next 10 years we can expect the bells to mature, like a good port. So to Alan, Kathryn, Nigel, Neil, Ben, Peter and all your colleagues, congratulations on producing this fine ring of bells, and thank you! One member of the congregation here told me that he didn’t realise how important the bells were going to be to the life of the church, and what a shame it was that St Magnus had to suffer a silent tower for 70 years. This ties in with my own personal vision of seeing the sound of bells restored to all those City towers that have had them taken away. Last week work was completed to restore the previously derelict ring at St Katharine Cree. I continue to pray and work towards the goal of hearing the sound of bells restored to St Andrew Undershaft, St Dunstan’s-in-the-West, and of course Mr Archdeacon, St Bride’s Fleet Street. What the experience at St Magnus shows is, it can be done, and done well, and done to benefit the ministry of the church in the process. So to all of you here today, I truly thank you for all you have done to help us and thank you for joining in the celebrations today. In particular, thanks and welcome to our Archdeacon and to our new assistant Priest, Fr Reji. I encourage you all to enjoy our hospitality after this Mass, do enjoy listening to the bells as they ring, and may you continue to enjoy these bells, whether you are listening to them or ringing them, for years, decades and centuries to come. The newly dedicated handbells are rung by ASCY Past Masters. The restored peal board is brought forward by Peter Rumley (who restored it) and James Foster (Steeplekeeper). The Master comes forward. The Master receives the charge of the bells. Peter Rumley with the restored peal board. John Loveless and Linda Garton under the tower. Andrew Wilby and Chris Rogers amongst others listening to the ringing. People were packed into every corner of the church for the service. The Master, Peter Valuks. The Trustees who steered the Fund to raise almost £300k, pictured here by Robert Lewis under the tower: Paul Mounsey (Chairman), John Hughes-D'Aeth, Fr Philip Warner, Dickon Love (Secretary) and David Hilling (Treasurer).